¿Por Qué No? ¡Sí Se Puede! B Y C TA P R ESIDEN T D A VID A. S ANCHEZ education. Class sizes are painfully larger, and many art, music, career technical education and other vital programs have been eliminated. More than 20,000 teachers, nurses, school librarians and counselors lost their jobs this year, and col- leges and universities have turned away thou- sands of students. 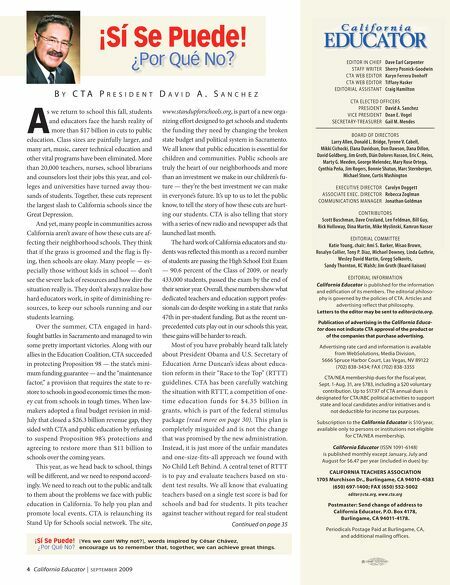 Together, these cuts represent the largest slash to California schools since the Great Depression. And yet, many people in communities across A California aren’t aware of how these cuts are af- fecting their neighborhood schools. They think that if the grass is groomed and the flag is fly- ing, then schools are okay. Many people — es- pecially those without kids in school — don’t see the severe lack of resources and how dire the situation really is. They don’t always realize how hard educators work, in spite of diminishing re- sources, to keep our schools running and our students learning. Over the summer, CTA engaged in hard- fought battles in Sacramento and managed to win some pretty important victories. Along with our allies in the Education Coalition, CTA succeeded in protecting Proposition 98 — the state’s mini- mum funding guarantee — and the “maintenance factor,” a provision that requires the state to re- store to schools in good economic times the mon- ey cut from schools in tough times. When law- makers adopted a final budget revision in mid- July that closed a $26.3 billion revenue gap, they sided with CTA and public education by refusing to suspend Proposition 98’s protections and agreeing to restore more than $11 billion to schools over the coming years. This year, as we head back to school, things will be different, and we need to respond accord- ingly. We need to reach out to the public and talk to them about the problems we face with public education in California. To help you plan and promote local events, CTA is relaunching its Stand Up for Schools social network. The site, s we return to school this fall, students and educators face the harsh reality of more than $17 billion in cuts to public www.standupforschools.org, is part of a new orga- nizing effort designed to get schools and students the funding they need by changing the broken state budget and political system in Sacramento. We all know that public education is essential for children and communities. Public schools are truly the heart of our neighborhoods and more than an investment we make in our children’s fu- ture — they’re the best investment we can make in everyone’s future. It’s up to us to let the public know, to tell the story of how these cuts are hurt- ing our students. CTA is also telling that story with a series of new radio and newspaper ads that launched last month. The hard work of California educators and stu- dents was reflected this month as a record number of students are passing the High School Exit Exam — 90.6 percent of the Class of 2009, or nearly 433,000 students, passed the exam by the end of their senior year. Overall, these numbers show what dedicated teachers and education support profes- sionals can do despite working in a state that ranks 47th in per-student funding. But as the recent un- precedented cuts play out in our schools this year, these gains will be harder to reach. Most of you have probably heard talk lately about President Obama and U.S. Secretary of Education Arne Duncan’s ideas about educa- tion reform in their “Race to the Top” (RTTT) guidelines. CTA has been carefully watching the situation with RTTT, a competition of one- time education funds for $4.35 billion in grants, which is part of the federal stimulus package (read more on page 30). This plan is completely misguided and is not the change that was promised by the new administration. Instead, it is just more of the unfair mandates and one-size-fits-all approach we found with No Child Left Behind. A central tenet of RTTT is to pay and evaluate teachers based on stu- dent test results. We all know that evaluating teachers based on a single test score is bad for schools and bad for students. It pits teacher against teacher without regard for real student Continued on page 35 ¿Por Qué No? ¡Sí Se Puede! [Yes we can! Why not? ], words inspired by César Chávez, encourage us to remember that, together, we can achieve great things. 4 California Educator | SEPTEMBER 2009 EDITOR IN CHIEF Dave Earl Carpenter STAFF WRITER Sherry Posnick-Goodwin CTA WEB EDITOR Karyn Ferrera Donhoff CTA WEB EDITOR Tiffany Hasker EDITORIAL ASSISTANT Craig Hamilton CTA ELECTED OFFICERS PRESIDENT David A. Sanchez VICE PRESIDENT Dean E. Vogel SECRETARY-TREASURER Gail M. Mendes BOARD OF DIRECTORS Larry Allen, Donald L. Bridge, Tyrone V. Cabell, Mikki Cichocki, Elana Davidson, Don Dawson, Dana Dillon, David Goldberg, Jim Groth, Dián Dolores Hasson, Eric C. Heins, Marty G. Meeden, George Melendez, Mary Rose Ortega, Cynthia Peña, Jim Rogers, Bonnie Shatun, Marc Sternberger, Michael Stone, Curtis Washington EXECUTIVE DIRECTOR Carolyn Doggett ASSOCIATE EXEC. DIRECTOR Rebecca Zoglman COMMUNICATIONS MANAGER Jonathan Goldman CONTRIBUTORS Scott Buschman, Dave Crosland, Len Feldman, Bill Guy, Rick Holloway, Dina Martin, Mike Myslinski, Kamran Nasser EDITORIAL COMMITTEE Katie Young, chair; Ami S. Barker, Misao Brown, Rosalyn Collier, Tony P. Diaz, Michael Downey, Linda Guthrie, Wesley David Martin, Gregg Solkovits, Sandy Thornton, KC Walsh; Jim Groth (Board liaison) EDITORIAL INFORMATION California Educator is published for the information and edification of its members. The editorial philoso- phy is governed by the policies of CTA. Articles and advertising reflect that philosophy. Letters to the editor may be sent to editor@cta.org. Publication of advertising in the California Educa- tor does not indicate CTA approval of the product or of the companies that purchase advertising. Advertising rate card and information is available from WebSolutions, Media Division, 5666 Spruce Harbor Court, Las Vegas, NV 89122 (702) 838-3434; FAX (702) 838-3355 CTA/NEA membership dues for the fiscal year, Sept. 1-Aug. 31, are $783, including a $20 voluntary contribution. Up to $17.97 of CTA annual dues is designated for CTA/ABC political activ ities to support state and local candidates and/or initiatives and is not deductible for income tax purposes. Subscription to the California Educator is $10/year, available only to persons or institutions not eligible for CTA/NEA membership. 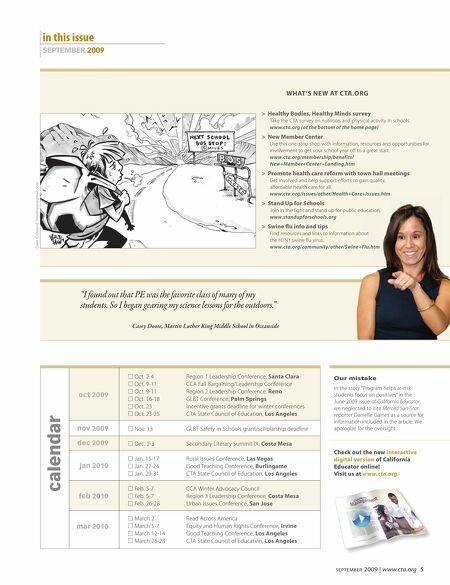 California Educator (ISSN 1091-6148) is published monthly except January, July and August for $6.47 per year (included in dues) by: CALIFORNIA TEACHERS ASSOCIATION 1705 Murchison Dr., Burlingame, CA 94010-4583 (650) 697-1400; FAX (650) 552-5002 editor@cta.org, www.cta.org Postmaster: Send change of address to California Educator, P.O. Box 4178, Burlingame, CA 94011-4178. Periodicals Postage Paid at Burlingame, CA, and additional mailing offices.